From the very start of Swimmo journey, we saw a huge interest in our training watch from Masters swimmers all over the world. They appreciated our feature set and pushed us to make Swimmo better every day since. That is why I’ve decided to write this short guide that makes it clear why Swimmo is a perfect device to help Masters swimmers achieve their goals faster and more efficiently. As Masters swimmers come often with experience of a pro athlete training regime, they instantly understand the benefits of measuring your swim. It is an indispensable part of making and maintaining progress in the pool. The problem often is that they are accustomed to a very traditional pen and paper approach when it comes to planning and logging their results. This means incomplete and imprecise swimming logs that are difficult to browse and compare with different periods so that you can clearly see what you excel in and what needs to be improved. With Swimmo, every time you start your swim, the watch automatically measures all metrics and saves them to your mobile app as soon as you are next to your smartphone. You simply open the app and can see charts, summaries and detailed result tables that are easy to browse and understand. It is also easy to view different time periods and detect any trends that will be useful when planning your future training sessions. Right pacing is important for all types of swimmers. It’s important for those on a shorter and longer distance to understand and achieve the right pace according to the stage of the swimming race. Getting a good ‚feel’ of the steady swimming pace can be very hard if you don’t work with a coach at all times – something that happens often for Masters swimmers. Swimmo can help with that letting you choose a perfect pace you want to achieve and then alerting you via vibrations every time you need to go faster or slow down. This way you can, for example, plan how you slowly increase your average pace throughout the season achieving your top form at the exact right time like before important competitions. When we ask Masters swimmers for their motivations they often talk not only about their love for swimming and training discipline but also about the thrill of the race. There’s no better feeling than the adrenaline rush just before the start of the competition. That’s why Swimmo App allows you to create a virtual list of your friends and turn it into a leaderboard that keeps score constantly and let you race virtually with other Swimmo users so that you are always excited and motivated when jumping into the pool. Measuring your swimming metrics is very important but of course for Masters swimmers planning their training custom goals are a must. That’s why Swimmo allows you to create your personal goals easily and quickly. To do that we use Swimmo mobile app so you can create edit and manage your goals on the go and at any moment. With a few simple taps, you can set your pace or heart rate zones, duration, and distance that you’d like to swim during the session. The goals you create sync with your watch and from now on are available on your Swimmo to select! This feature makes planning your workout simple and fun. To perfect your technique and build strength and flexibility of different parts of your body you as masters swimmer need to remember about various kick and drill sets. For many swimming trackers, this is a serious problem but we have found a way to let you also measure those parts of your training. 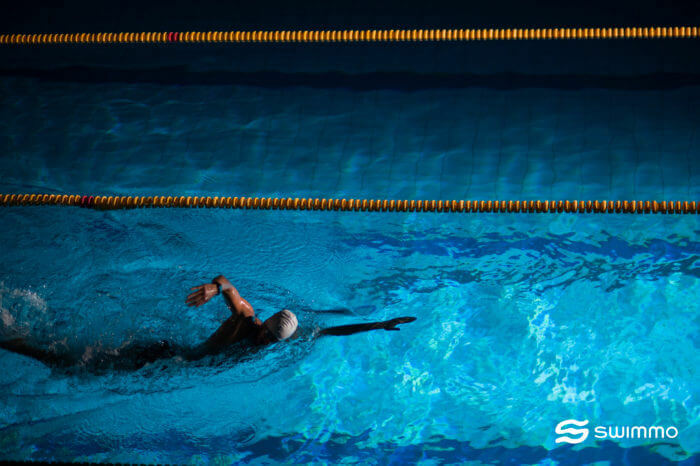 When in Kick & Drill mode, Swimmo ignores the movement characteristics like strokes and uses only our directional sensors that recognize the change of direction and swimmer’s turns – this way Swimmo can measure your distance in drill sets automatically. We hope you enjoyed this little summary and if you are interested in getting your own Swimmo, check out three different color versions available on our website.